If you are one of those unfortunate enough to have sought your information from more established Nigerian newspapers about today's proceedings in the court case about Senator Abaribe and other sureties, you would be forgiven for thinking that these brave men that stood surety for Kanu is about to be thrown into jail. Nothing could be further from the truth. As a matter of fact the headlines were concocted to hide the shame of the Attorney General of the Federation (AGF) and Justice Binta Nyako who both did not follow the right process before requiring the sureties to 'show cause'. This is a summary of proceedings today. It was a victory of sorts for IPOB as those who actually understand how common law system of jurisprudence works would tell you. Deficit of basic understanding of legal processes coupled with poor education in Nigeria is routinely reflected in very poor reporting of court proceedings leading to outright misrepresentation of inherent facts. Journalists often report IPOB cases from a position that seem to suggest that they are doing their bit to keep Nigeria one. The screaming and often sensational headlines that accompany each court session involving IPOB gives the impression that journalists are under instructions and prompting of Lai Mohammed's Ministry of Information. There is no other rational explanation as to why journalists who are poorly schooled in the finer details of law will simply pick a sentence from what a judge said during case summary to write what is patently false and outright lie. Here is precisely what happened today 28 March 2018 in Binta Nyako's Federal High Court sitting in Abuja. In a short ruling, Justice Nyako who noted that the three sureties raised a valid issue of law, directed that copies of enrolled orders be served on the defence team by the office of the AGF before the close of work today. 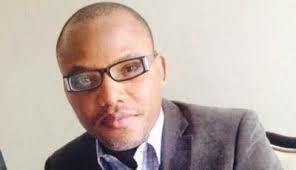 The Order To Show Cause is for the "sureties to adduce evidence to explain the nonappearance of Nnamdi Kanu for trial"; not "risk jail" as wildly reported. That's when all the Motions, Applications, Affidavits and Exhibits on the Army invasion mature for consideration/hearing. What they should have reported is that the judge Binta Nyako realized her errors after the submissions of the defence. Lawyers for the sureties taught Binta Nyako (judge) and Labaran (prosecutor) both of whom are Fulani, what they don't know in law today. Before any judge will even dream of committing Senator Abaribe or any surety to jail, he will first of all confront the actual footage of the military invasion, account for the 28 dead bodies of IPOB family members and sworn affidavits by victims. When the court get to this stage the world will know what a big mess Buratai is in.